Central American migrants take a break from traveling toward the U.S., in Matias Romero, Oaxaca, Mexico, April 3, 2018. Mexican officials on Tuesday screened a dwindling group of hundreds of largely Central American migrants who are moving through Mexico toward the United States, seeking to break up the "caravan" that has drawn the ire of U.S. President Donald Trump. Trump, doubling down on his tough stance against illegal immigration, has railed against those making their way from the Guatemala-Mexico border in the past 10 days. ​Trump repeated threats to torpedo the North American Free Trade Agreement, which underpins much of Mexico's foreign trade, and said he wanted to send troops to the U.S. border to stop illegal immigrants until a long-promised border wall is built. In response, the Mexican government has said the migrants are being vetted to determine whether they have a right to stay or will be returned to their countries of origin. 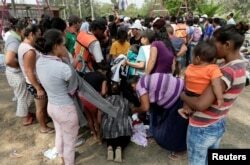 Hundreds of men, women and children from Central America were stuck Tuesday in the town of Matias Romero in the poor southern Mexican state of Oaxaca, awaiting clarification of their legal status after officials began registering them. Confused and frustrated by paperwork, many were uncertain about what lay in store, and desperate for information. "What was the point of all this then if they don't let us stay?" Elizabeth Avalos, 23, a migrant from El Salvador who was traveling with two children, said angrily. "There's no food, my children haven't eaten since yesterday." Hundreds of people camped out overnight in a park near the town's train station, with shoes and bags strewn about. Jaime Alexander Variega, 35, sat alone in a patch of shade and cupped his head in his hands, weeping or praying, his feet still bearing lacerations from walking for four or five days straight through Guatemala from El Salvador. "We're not safe in El Salvador," said the former security guard, his hat smeared in dirt, explaining he had left his home because of the threats from local gangs. "I know it's difficult to get into the United States. But it's not impossible." Around them, Mexican migration officials with notepads and pens took basic information from the migrants, asking for names, nationalities, dates of birth and proof of identity. The caravan was organized by U.S-based advocacy group Pueblo Sin Fronteras, which seeks to draw attention to the rights of migrants and provide them with aid. The Mexican government says the caravan, which like others travels by road, rail and on foot, has been organized every year since 2010. Honduran Carlos Ricardo Ellis Garcia clutched a handwritten list of names belonging to more than 100 people who joined the caravan in the southern border town of Tapachula, where it began on March 25, reaching a peak of around 1,500 people. Central American migrants' clothes dry on a fence, as the migrants take a break from traveling in their caravan on their journey to the U.S., in Matias Romero, Oaxaca, Mexico, April 3, 2018. But by Tuesday the number was down to about 1,100, according to Pueblo Sin Fronteras spokeswoman Gina Garibo. Many had broken off from the group, eager to move on more quickly, she said. Many others aimed to stay in Mexico because they had family ties there or planned to work, Garibo said. "Now they're separating these groups," Ellis Garcia said, referring to an estimated 300 people who split from the caravan on Monday. "I don't know what's the deal. We have no answers." Advocacy groups told Reuters dozens of people left the caravan and traveled to the crime-ridden eastern state of Veracruz, where they were met by migration officials and police. The government said on Monday evening that about 400 people in the caravan had already been sent back to their home countries. Central American migrants receive donated clothes on their journey to the U.S., in Matias Romero, Oaxaca, Mexico, April 3, 2018. Geronimo Gutierrez, Mexico's ambassador to the United States, told CNN that Mexican authorities were "looking at the status of the individuals so we can proceed either with a repatriation process" or offer humanitarian relief. That could include granting asylum or humanitarian visas. Trump, who ran for office in 2016 on a platform to stem the flow of illegal immigrants from Mexico, said he had "told Mexico" he hoped it would halt the caravan. The migrant caravan also poses a political problem for Mexico's unpopular government in a presidential election year. President Enrique Pena Nieto is barred by law from seeking re-election in the July 1 vote, but the ruling party candidate is running third, well behind the front-runner. The government does not want to be seen as kowtowing to threats by Trump, who is deeply unpopular in Mexico. In a country where millions of people have friends or relatives who have migrated legally or illegally to the United States, many Mexicans harbor sympathy for the Central Americans.